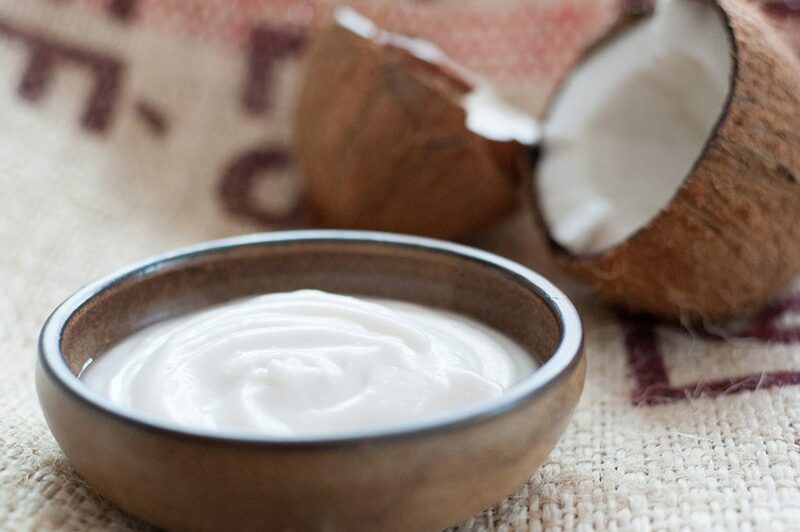 For the ultimate in coconut yoghurt luxury, make this at home with your Thermomix! 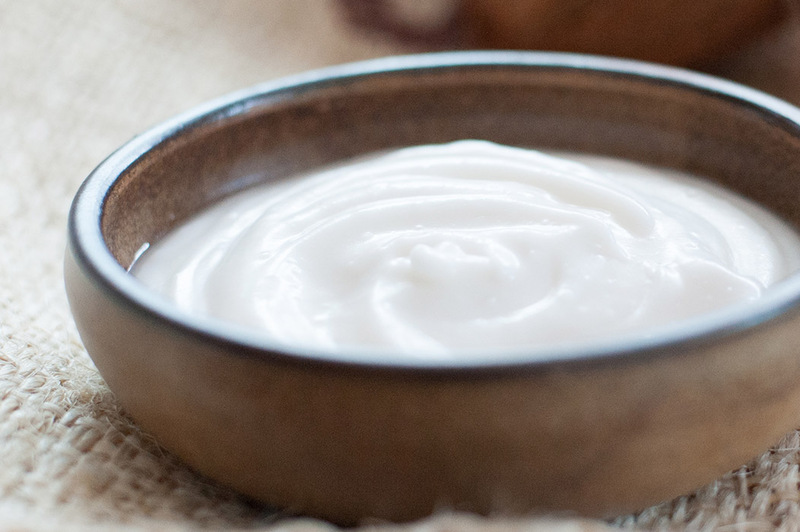 I became besotted with organic coconut yoghurt when travelling in Australia last year and wanted to be able to easily make it instead of buying it. Most commercial yoghurts have ingredients I choose to avoid, but homemade means complete control over my ingredients – hooray! No fillers, no gums, no unwanted sugar, no flavourings. In this recipe I start by making fresh homemade coconut milk – it gives the yoghurt a much fuller flavour than the many varieties I have bought. Using a dehydrator to culture coconut yoghurt at a constant even temperature gives excellent results. If you don’t have a dehydrator, you can follow the method in the tips instead. Allow 2 days for culturing and chilling time. This recipe was inspired by Jo Whitton’s beautiful book Quirky Cooking, and I want to say a very warm thank you to Jo for her ongoing commitment to sharing her knowledge about good health. Mince coconut pieces 20 sec/speed 8. Add water and heat 10 min/100°C/speed 2; meanwhile, line simmering basket with a double layer of cheesecloth large enough to generously hang over the sides and place lined basket in a large bowl and set aside. Blend 1 min/speed 9, then pour into lined basket and allow to drain. When cool enough to handle, lift up cheesecloth and squeeze out all remaining coconut milk. Discard squeezed coconut flesh or use to make coconut flour – see tips. Place strained coconut milk and melted coconut oil in TM bowl then blend 30 sec/speed 8. Add agar agar and heat 10 min/100°C/speed 4, then set TM bowl aside to cool approx. 2-4 hours until coconut milk is 37-45°C – to check, use a temperature probe. Once at 37-45°C, add maple syrup then open probiotic capsules and add contents to TM bowl (discard the empty capsules). Blend 30 sec/speed 8; transfer to sterilised glass jars (jars must be warm or at room temperature, i.e. not hot, before adding mixture) and seal with sterilised lids, then place in a dehydrator set at 45°C and leave to culture for 18 hours – see tips to culture without a dehydrator. Place jars of cultured mixture in fridge overnight to chill – a thick layer will rise to the top and become solid.Transfer chilled cultured mixture including solid pieces to TM bowl, mix 30 sec/speed 6, scrape down sides of TM bowl with spatula and repeat. Yoghurt can be served at this point or transferred back to jars and stored in fridge up to 5 days. Serve on its own, with fruit for breakfast or dessert, or use in recipes instead of Greek (dairy) yoghurt. Leftover coconut flesh can be frozen up to 2 months. If you don’t have a dehydrator, in step 6 transfer mixture to a clean insulated bowl, thermoserver or thermos jug, put the lid on, wrap in a heavy beach towel or blanket, place upright in an insulated bag, close the bag and leave undisturbed for 18 hours to culture. 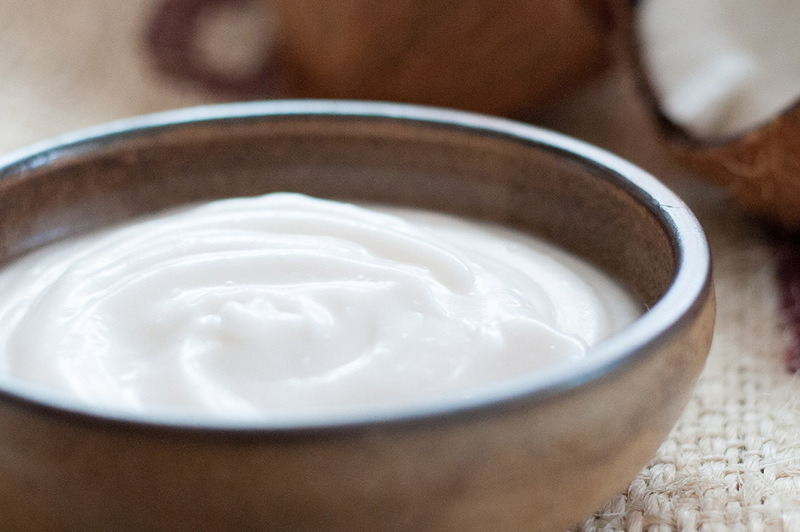 Although probiotic capsules can be expensive, the ingredients still cost about half the price of a similar volume of commercial coconut yoghurt. To make coconut flour: dehydrate squeezed coconut flesh for 6-10 hours at 45°C in a dehydrator or dry in a low oven at 50°C without fan/100°F/gas ½/Aga warming oven until completely dry, then cool to room temperature and grind 2 min/speed 10. Store in a clean glass jar in a cupboard and use within 6 weeks.